This example shows how to create a generic COM component using a MATLAB® function. You can then pass the generated package to the developer who is responsible for integrating it into an application. The target system does not require a licensed copy of MATLAB. In MATLAB, examine the MATLAB code that you want packaged. 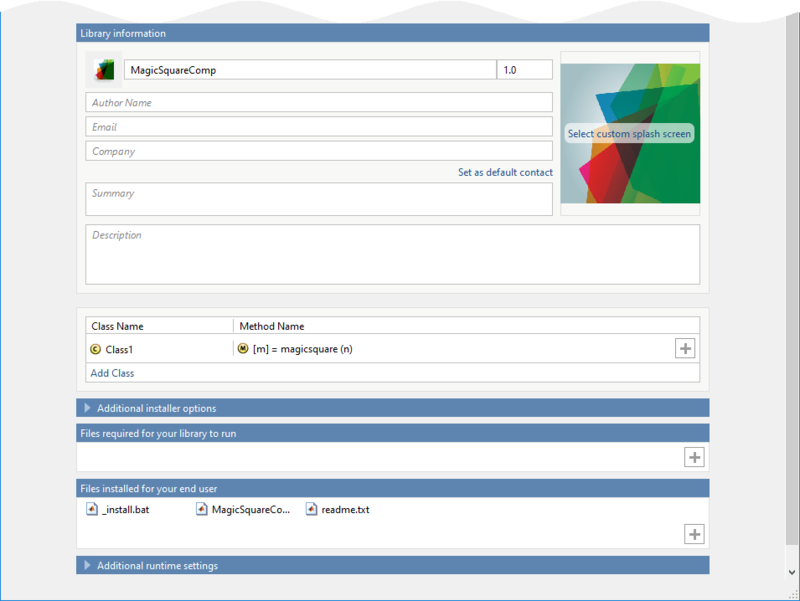 For this example, open makesquare.m located in matlabroot\toolbox\dotnetbuilder\Examples\VSVersion\COM\MagicSquareExample\MagicSquareComp. On the MATLAB Apps tab, on the far right of the Apps section, click the arrow. In Application Deployment, click Library Compiler. In the MATLAB Compiler project window, click Generic COM Component. Alternately, you can open the Library Compiler app by entering libraryCompiler at the MATLAB prompt. In the Library Name field, replace makesquare with MagicSquareComp.